Proud to be providing quality fresh food & professional service to the Vancouver area for over 3 decades. Whether it be a corporate lunch delivery, cocktail reception, wedding, gala dinner or summer barbecue, our team of professional chef’s and servers are focused on making your event truly one to remember with excellent food, presentation and outstanding service. "Just Right" is a full service Vancouver caterer specializing in corporate and social special events, we believe in using only the finest of west coast ingredients and rely on our experience, creativity, vision and passion for innovative dishes to exceed your expectations. 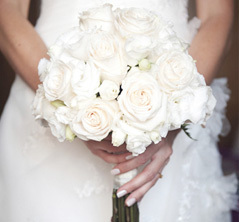 We provide service for all types of events and occasions. 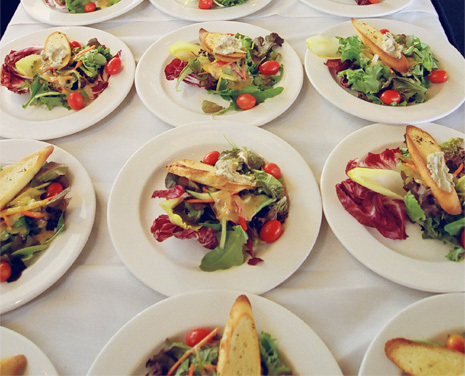 Whether it be a corporate lunch delivery, cocktail reception, wedding catering Vancouver, gala dinner or summer BBQ catering Vancouver, our team of professional caterers and servers are focused on making your event truly one to remember with excellent food, presentation and outstanding service. 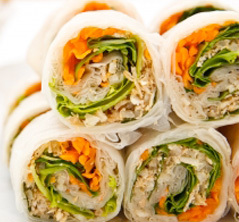 Why Are We the Best Caterers Vancouver Has to Offer? We use only fresh and high-quality ingredients, with which we make all our foods including sauces from scratch. Since we don't use any processed food, all our products are free from msg and transfat. In fact, we don't even have a deep fryer or microwave oven in our kitchen! We source all our raw ingredients from responsible suppliers as we believe it's our responsibility to provide not just good, but also sustainable food to our customers. This is why we promote healthy and sustainable practices, regardless of the number of guests or occasion. Our professional chef has more than three decades of experience in creating gourmet foods and everyday staples that are sure to excite your palate. Our kitchen team comprises of talents from different ethnic backgrounds, and this helps us to widen our offering to include influences from Europe, Asia and India as well. You can choose from our standard menu packages or we can customize them to suit your needs. Our corporate catering Vancouver food planner will get in touch with you to understand the nature of the event, timing and the number of expected guests. Based on these aspects, we'll make appropriate suggestions, and will work with you to create the perfect menu that will impress your guests. When you order through us, you can sit back, relax and enjoy the event with your loved ones. 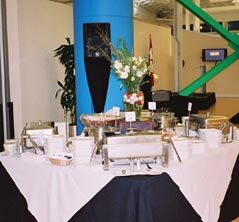 We take care of everything for you, right from setting up tables to picking up after the event. Specifically, we can set up your tables with appropriate linens, provide service and display equipment, fine plateware, cutlery, glassware and disposable paper napkins, and have professional service staff to serve food. Use water judiciously during our cooking process. Minimize energy consumption by adhering to our established policies related to administration, cooking, equipment selection and storage. 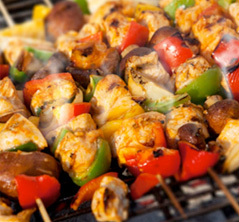 Provide meat and poultry from sources that conform to established animal welfare standards. Serve seasonal fruits and vegetables whenever possible. Reduce, reuse and recycle non-food items. Have energy efficient fixtures that reduce water and energy consumption. We also work with local food banks and communities to prevent hunger. Our aim is to provide the best-quality food and service, so your event is enjoyable and hassle-free for you and your guests. We do everything we can to achieve this objective. This is why your healthy, sustainable and delicious party food starts with us. If you have any questions or want a complementary quote for your menu, get in touch with us right away. Our friendly menu planners and chefs are standing by to assist you in every way possible. Thank you so much for all your help! The wedding day was perfect and your staff was great. Everyone was well fed and had a great time. Thank you so much for making it so easy! I will be sure to pass on the "Just Right" name. I would like to thank you and your caterers for your excellent service and work ethic provided to us over the years. I feel that each of the providers and those involved in the preparation of this event has offered a helping hand to a lot of people in need, and something we should all be proud of – we have all made a difference. It is the end of an era, with a new direction which no doubt will bring about a number of changes going forward. Again, thank you and should I have the opportunity to organize an event where your services are needed, I will definitely be in touch. I want to congratulate and appreciate your team for the excellent service and food you provided us on Friday evening. The seniors enjoyed the meal and very much appreciated the delicious vegetarian option. There were oohs and ahhs from everyone. Please continue your business.